How two Chicagoland home builders are building homes that fight global warming. In recent weeks, we have witnessed dramatic weather events. Huricane Harvey and Hurricane Irma have both been strengthened by warming waters in the Atlantic Basin and the Gulf of Mexico making these storms some of the most destructive in North America’s recent history. The videos depicting masses of Americans displaced by these storms are heartwrenching and the stories of the heros that loaded their vehicles with supplies to deliver care are inspiring. The rebuilding will, in time, become a story how America recovers through innovation from disaster. So what does a hurricane in Texas or Florida have to do with homebuilding in the Chicago Area? The answer is Carbon Dioxide (CO2) emissions. Everytime you turn on a light, open the refridgerator, heat or cool your home, you contribute to CO2 emissions. The average American household produces 7.2 Tons of CO2 emissions each year. What if the next generation of homes could produce significantly less CO2? 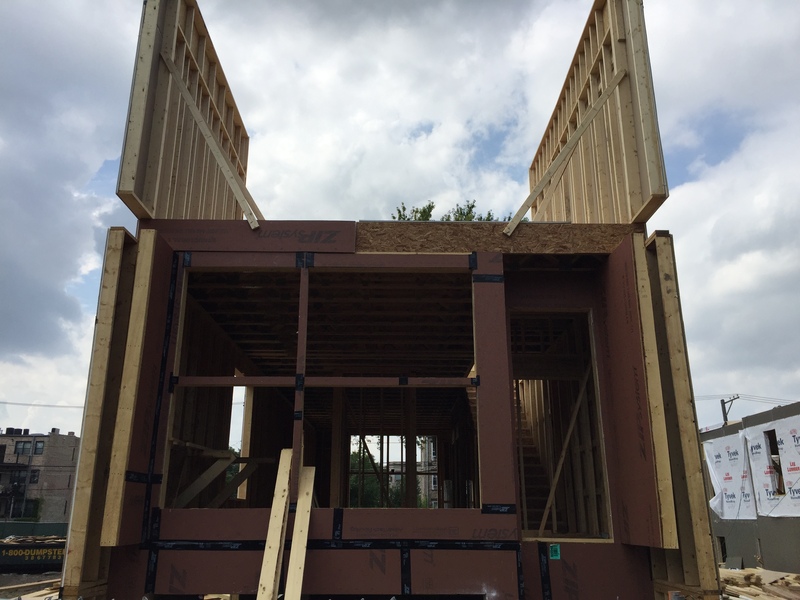 This blog will be updated weekly and will follow the progress of two homesites in Chicagoland, that demonstrate how we could change the way we build our new homes, to minimize their CO2 footprint. The first home is being constructed on a vacant lot in the suburban village of Brookfield, less than 12 miles from Downtown Chicago. The homesite was a vacant lot, walkable to Metra trains, with plenty of local ammenities nearby. The project plans to build a 4 Bedroom/3.5 bath custom single family home for a client of Beals & Associates. The builder is Brightleaf Homes, a local, experienced homebuilder, specializing in high performance suburban home building and has many completed projects in the Brookfield/LaGrange market area. The second home is also being constructed on a vacant lot but in Chicago’s rapidly redeveloping Bronzeville community. The home is located at 4516 South Prairie and is part of a series of homes being built on a contiguous string of vacant lots in the 4500 block of South Praire Avenue by 5 different home buiders. 4516 South Prairie is being constructed by Greenline Homes and will ultimately be a 5 Bedroom/3.5 Bath high performance home built on an urban site with an alley in the rear. Greenline is an experienced high performance home builder that has been buiding in Chicago for the past 14 years. Highlights include a solar photo voltic system generating electricity on the rooftop. Both homes will be built with dozens of inniovations to reduce their CO2 footprint. We will detail these from the ground up in this blog.